Today has been a hectic day. We started out heading south to the children’s museum to meet up with friends, but it was pouring rain and there was an accident right at the exit ramp we had to take which slowed us down considerably. We didn’t get to stay long before we had to leave to get to A-Man’s optometrist appointment. Skip took some time from work to hang with Gater and CJ so A-Man and I could take care of everything as peacefully as possible. We arrived at 11:30 for our 11:30 appointment. At 12:15, A-Man was getting restless, I was hungry, and we were both sort of cranky. I checked with the receptionist who said they were running behind, but they did offer to get A-Man started y dilating his eyes and doing a preliminary check. We went back for that and they gave him a sucker to appease him (should add he’d already had a peanut butter cookie in the waiting area prior to this). He did the first exam, then they put the drops in, which, of course, sting, and so he freaked out. We heading back to the waiting room to wait for his pupils to dilate. At something like 12:45, we head back and lo and behold, his left pupil has not dilated. At all. This time, I practically have to pin him to the floor to get the drops in,. because he knows how this works and he’s not happy about it. We follow up with more waiting and another peanut butter cookie. Sugar is now coursing through his veins, he’s tired, I’m crabby, Skip needs to get back to work, and we are still waiting. The doctor is apologetic – apparently there is a new doctor in the practice who needed some training, that took forever, now our doctor is behind, A-Man’s eyes aren’t cooperating, the sugar crash is coming on and no amount of Angry Birds can save us. Oh, did I forget to mention I am PMSing bad? This is going downhill fast. We are finally back in the exam room at which time the Craigslist sale I had arranged arrives at our house – where I am not – and now I am trying to text Skip about what I want for the item in the dark, on my phone that is not made for texting (you know, where you have to hit the 2 button 3 times to type a letter “C”), as the doctor is trying to examine A-Man, who has completely lost interest at this point. Craigslist lady is haggling about the item and I am trying to text, but Skip is texting faster than I can reply and I am nearly in tears. I finally call him, tell him I want what I said in the ad for the item and no less, I’ve got to go, and I try to talk to the doctor. The next thing I know, I am getting the prescription, but I can’t get the glasses at that office because the glasses that our insurance covers are only available at the OTHER office and now I can’t get a hold of Skip to tell him we are on our way (because he was already on his way to us) and I am either going to cry or scream as I walk out into the rain with A-Man and a prescription. I realize now, in the doctor’s frazzled state being 2 hours behind in his day, and my exasperation, I asked no questions about his diagnoses, got not info on follow-up schedule or care, nothing. I get A-Man set up to eat and try to call the doctor, which of course triggers immediate screaming and fighting from all three kids and I AM ABOUT TO LOSE IT, PEOPLE! The doctor gets on the phone and is so apologetic, again, that he was so flustered he didn’t give us all the info and he spent a good deal of time talking it over with me. A-Man is farsighted and has an astigmatism in both eyes, and we’re going to get him glasses and then check him after 3 months of wear to adjust the prescription if needed, see how he is doing, etc. He may improve with time, or he may not, but we feel that the glasses are in his best interest at this time. He has so many issues already with his emotions and senses that we are thinking that helping his vision improve might alleviate some his his stress and hopefully take his volatility down a notch. Oh, but we haven’t even gotten the glasses yet! 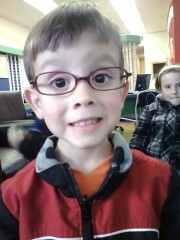 So I have to drag them all BACK out in the rain to the other office and we did get to pick out his glasses. He wanted ones like mine. The ones he has in the pic below are the ones he got, but we ordered a smaller size for him. I think he will be super cute. And to think…. all of this went down before 4 pm today! Prev The boys are 4! Oh goodness! What a day! He’ gonna be super-cute and I hope they help him. A month to wait for his glasses is excessive. What’s the deal with that?